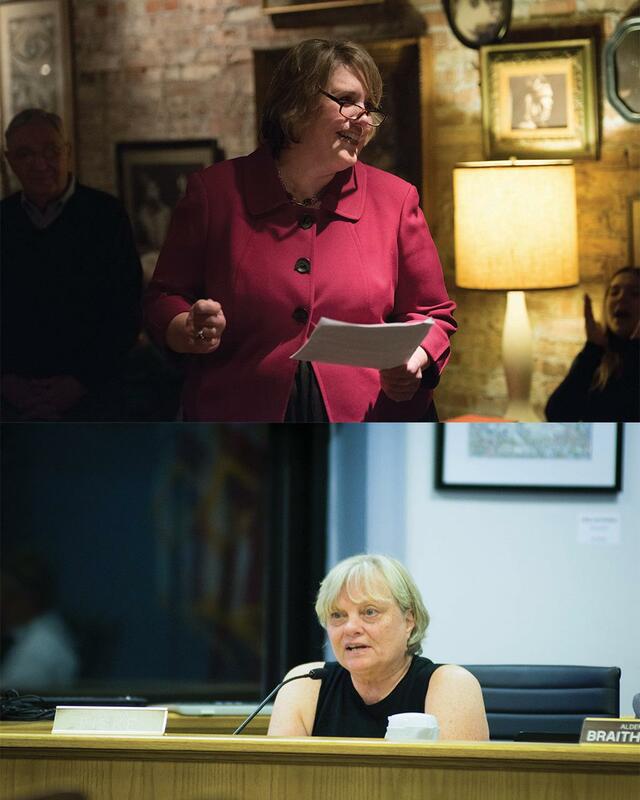 Candidate for 1st Ward alderman Lee Cabot (top) talks to the crowd during her campaign kickoff in January. Ald. Judy Fiske (1st) (bottom) attends a council meeting. Candidates in the 1st Ward aldermanic race repudiated separate ethics claims against them this week, adding to an already tense election cycle. Ald. Judy Fiske (1st) apologized for using a senior citizen’s photo without permission, and her opponent, Lee Cabot, denied allegations of a “conflict of interest” stemming from her position as a full-time Northwestern employee. The issues come after an especially contentious election season, in which numerous candidates have sought to disqualify their opponents for various reasons. The latest round of questions comes roughly a week before Evanston residents choose a new City Council, a new mayor and a city clerk in the April 4 election. Carolyn Lickerman — a resident of senior living community Mather and a supporter of Cabot — said she filed a complaint with the board of elections last week after Fiske used her photo to advertise without permission. Lickerman said the candidate came to speak with residents earlier this month at what she considered a private event. While sitting in the back of the room, Lickerman said Fiske approached her and “rudely interrupted” a conversation. During the ensuing interaction, Lickerman said a member of Fiske’s campaign took a picture of the trio without permission. Lickerman said she discovered the photo upon receiving a promotional pamphlet from the campaign in the mail. Fiske said she apologizes for the “mistake” and that the photo was no longer being used in any advertising. She added that staffers from both campaigns often snap many pictures during events, but admitted that she should have reached out to Lickerman before using the photo in promotional materials. Fiske has also raised an issue of her own. Because Cabot is a full-time NU employee, Fiske said, the candidate should recuse herself from University-related votes. Fiske cited an incident pertaining to Coleen Burrus, a former 9th Ward alderman who was criticized in 2010 for favoring an ordinance to ban private pushcart vendors from the area around Ryan Field on NU game days. At the time, Burrus worked as NU’s director of corporate relations. But Cabot called those assertions “baseless” and said the board’s opinion did not apply in her case. While Burrus served in a leadership position, Cabot said she works as a program assistant at the Segal Design Institute, providing administrative support for an individual program. As the position has no control over policy or connection to the University’s “central office,” Cabot said, there was no conflict of interest. Nevertheless, Cabot said she had done her ‘homework’ and employed an attorney to review the matter. The campaign also sought out a local expert to clarify the issue. In a letter posted to Cabot’s website, Scott Gingold (School of Law ’98) — an Evanston-based attorney who sits on the Zoning Board of Appeals — said only a “direct financial interest” could give rise to a conflict of interest. As Cabot would not financially benefit from decisions made about the University, Gingold wrote, the candidate could not have a conflict of interest. “Quite honestly, I’m much more impacted — as a homeowner in Evanston near the university — by what happens to my property values and my property taxes than I am by what happens to Northwestern as a whole,” Cabot said. This article was updated to clarify that Lee Cabot did not pay Scott Gingold for his letter regarding a potential conflict of interest. A second lawyer was paid for a legal opinion.